Peppermint favors are perfect for a winter event! The cool and refreshing flavor of these Life Saver Mint Favors is sure to delight your guests. 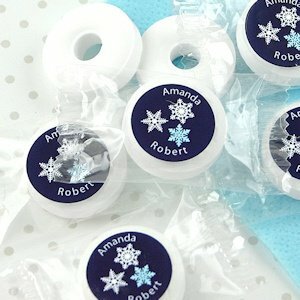 Each revitalizing mint favor comes assembled with a label in your choice of winter designs along with 2 lines of text. Individually wrapped, these favors look great as part of the centerpiece, in bowls on your event tables or as part of your gift bags. Suggested quantity per guest: 5-10 mints.